Nation building: Some references to Amanutullah Khan in my book "AAP & Down"
Some references to Amanutullah Khan in my book "AAP & Down"
"In the meantime, the BJP persisted with its attempts at forming a government in Delhi. Rumours emerged that it was now trying to poach some of the Congress’ Muslim MLAs—Mateen Ahmed, Asif Mohammed Khan and Hasan Ahmed. Arvind grew even more worried on witnessing these manoeuvrings. He also grew increasingly obsessed with stopping the BJP, no matter the price. Posters were made anonymously and plastered across the locality where the Congress MLAs lived—these posters referred to the MLAs as ‘traitors of the community’ and called for protests outside their residences. The Delhi police swung into action, removed the prints, registered a case under sections of the IPC for promoting enmity between two groups and for the defacement of property, and arrested Dilip Pandey, AAP’s Delhi unit secretary, along with a few AAP volunteers. Arvind went on the defensive, claiming that the BJP was framing his party after failing to form the Delhi government. He further suggested that someone named Amanatullah Khan, an erstwhile member of the BSP, had put up the posters and had even confessed to it, but the police seemed to wish to target AAP volunteers. What exactly was going on? 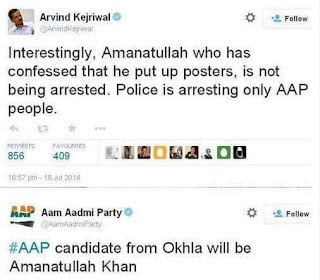 It wasn’t hard to join the dots when, soon after, Amanatullah Khan was given an AAP ticket and was designated in-charge of the Okhla constituency. He was to play a much larger role in the future. Like Naveen Jaihind, he’d become Arvind’s go-to man." 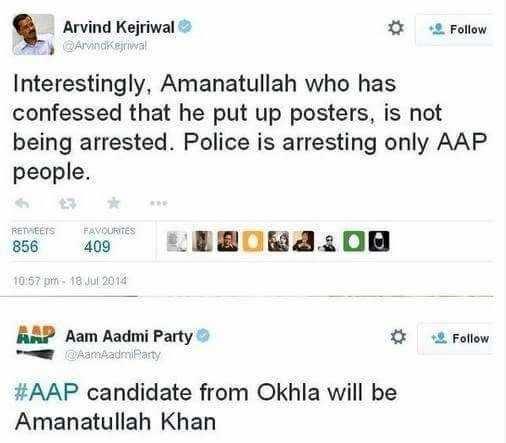 A development that especially angered Prashant was that Amanatullah Khan (of the communal poster fame) had been given a ticket to contest elections from Okhla. He longed to expose AAP’s volte-face. He was placated with the promise that within two to three days of the results of the Delhi assembly elections, an NE meeting would be called, and the party would create models of transparency, accountability and participation. "Arvind had to plot a counter-attack. And he did this through Amanatullah Khan. Amanatullah Khan alleged that Kumar Vishwas was an RSS stooge. Left with little room for manoeuvre, Kumar cobbled together support and demanded the removal of Amanatullah from the PAC, and also demanded a position of leadership in Rajasthan. To retain Kumar, Arvind accepted his demands. Yet, even as Amanatullah quit, Arvind made him the chairman of a panel of the Delhi Assembly and a member of seven newly constituted committees, including the Special Inquiry Committee. ‘Take that,’ Arvind seemed to say. " See <http://indianexpress.com/article/india/politics/aap-delhi- unit-secretary-arrested-arvind-kejriwal-blames-bjp/>; <http:// www.caravanmagazine.in/vantage/mlas-just-beginning-prashant- bhushan-aap-legal-troubles>; <https://economictimes.indiatimes. com/news/politics-and-nation/Posters-against-Congress-MLAs- sellout-to-BJP/articleshow/38534720.cms>, accessed on 23 November 2017. See <http://www.hindustantimes.com/delhi-news/aap-s- amanatullah-khan-quits-top-post-sisodia-says-kejriwal-hurt-by- vishwas/story-kEJj1RaceaXPRRouZ3XiEM.html>, accessed on 4 December 2017. See <http://www.dnaindia.com/india/report-suspended-from- aap-amanatullah-khan-made-chairman-of-panel-of-delhi- assembly-2429057>, accessed on 4 December 2017. Mayankji, Thank you for making this dangerous politician AK naked, with your blogs and the recent book. World has to see his real face. He is more dangerous than corrupt congress and communal+corrupt Modi.